Remember the Discwasher Zerostat? That red plastic "gun" was, for many years, the only sure fire cure for the static "cling" of LPs to their platters, and of dust to LPs (and of skirts to nylons, but we wouldn't know about that...). Discwasher discontinued them years ago but, guess what, the enterprising folks at Milty (UK) have brought them BACK, and are making 'em just like we remember (except they're now blue). Operation is simple: point the gun at the object you want de-staticised (about 8 to 10 inches away) and S-L-O-W-L-Y pull the trigger. If you hear any "clicks" you've pulled it too fast. Whatever you do, DON'T press the "muzzle" against any part of you and squeeze the trigger. It smarts; honest. The Zerostat works on the principle of negatively and positively charged particles. When you "zap" an object with the Zerostat, you're actually bombarding its surface with particles that are the opposite charge of the ones creating the static "stickiness", thereby disrupting their hold on the object and breaking the static field. It's perfectly safe; the effects are usually temporary (some folks swear that "zapping" CDs with the Zerostat before play actually improves their sound!). The Zerostat is particularly effective against LPs that, having been played, are reluctant to come up off of the platter without a struggle (and wind up making that crackly sound that means the LP is attracting every piece of dust within a five-mile radius). The solution? At the end of playing a side, simply "zap" the LP with the Zerostat and, voila!, off it comes with no hassle. People put the Zerostat to an amazing number of uses: We've sold them to chemical supply houses who don't want static charges messing up their measurements and digital imaging labs where dust is verboten. It's also a simple way to get rid of the dreaded "static cling" in clothing! 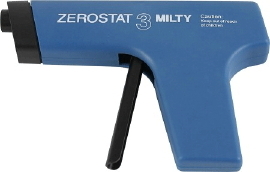 The Zerostats charging element should last many years, and its construction is rugged enough to survive any abuse. Give it a shot!